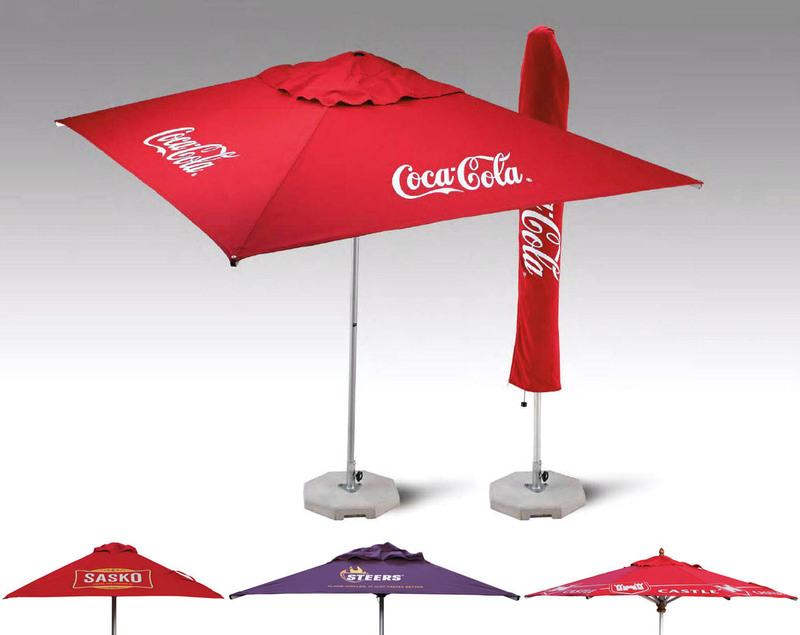 For the past 27 years Woodline Shade Solutions has been supplying a comprehensive range of top-quality, price-competitive OEM parasols for the local and international market. Well-known international brands and contract market customers have maximised their branding and got their campaigns into the marketplace using our custom printing service. Our in-house design team can take your branding all the way from concept to finished reality, tailoring your umbrellas to suit your requirements and best showcase your company. We only use the finest inks and techniques that ensure your branding lasts the test of time, even in the harsh outdoors. 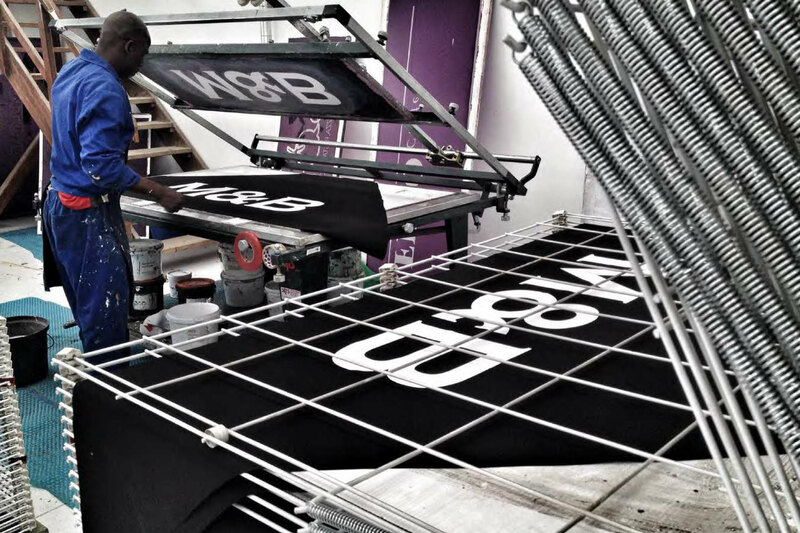 Our premium grade screen printing service is available on both Solution dyed and Acrylic fabrics and comes with a standard 1 year warrantee on printing. Screen printing is best suited to simpler designs that feature flat colors (we can do up to to 8 colors). Our smaller screens have a maximum printable area of 43,3” x 68,9”, while our largest can go up to 155,1“ x 86,6”. Artwork needs to be supplied as Pantone vector files. In order to offer our clients unlimited design options we have invested in one of Africa’s first digital latex printers allowing our clients to achieve stunning full color photographic effects on specially prepared Polyester fabric. This high-productivity industrial printer is capable of producing exceptional output, using water-based latex inks to provide high-quality, durable results that are instant drying and friendly to the environment. We can print up to 126” wide by any length that is required. The excellent fidelity and wide gamut of colors that are able to be achieved make this a perfect solution to complex or photographic designs and opens up an unlimited ability to be creative with your brand. High resolution artwork needs to be supplied in CMYK colour mode as vector or TIFF files. Metallics or lumo colors need to be screen printed after the digital printing as a separate spot color. 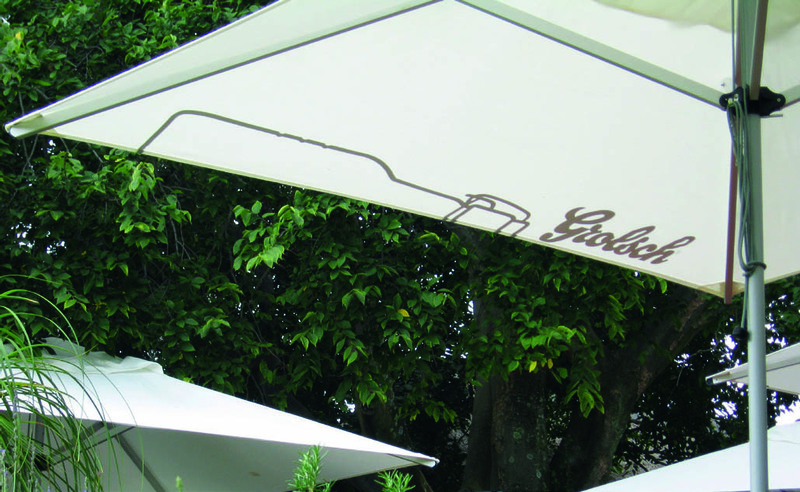 The parasol’s outstretched canopy offers prime branding real estate. 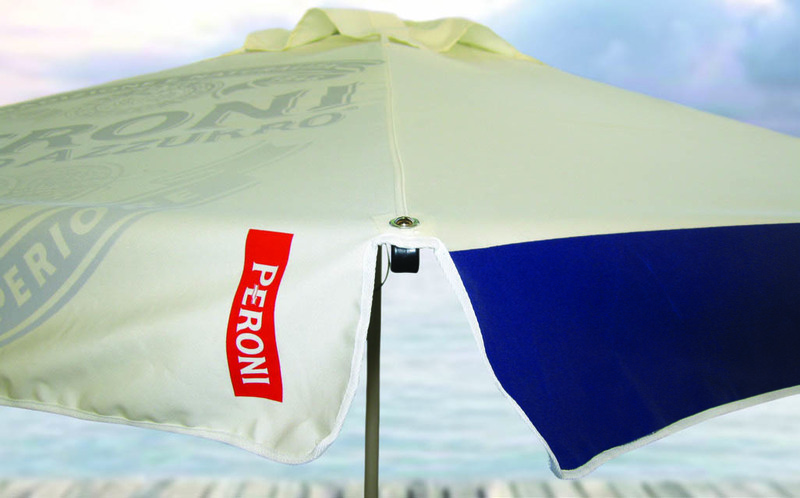 Visible from a distance and from above, make the most of your parasol’s outdoor exposure by printing on the canopy topside. The vertical sides of a valance offer the perfect space to communicate your brand’s message, directly in the line of sight just above head height and visible up close or from a distance. 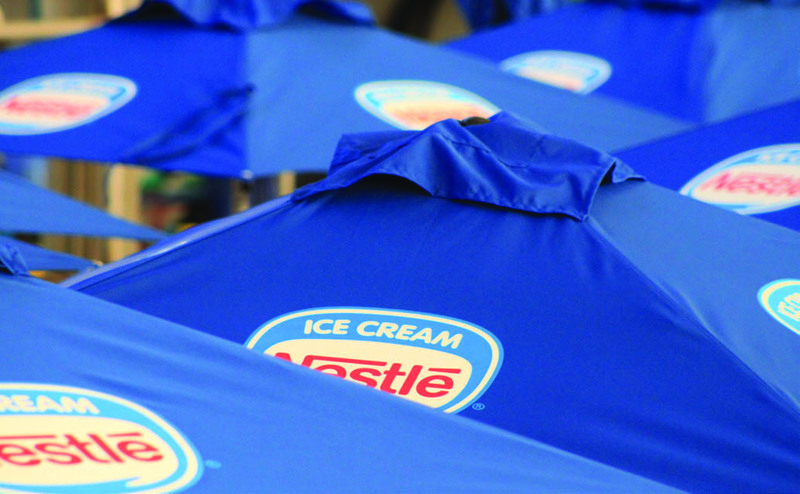 The underside of the canopy is a great space for people to get up close and personal with your brand and its message. Predominantly viewed whilst enjoying the shade and shelter at close quarters. 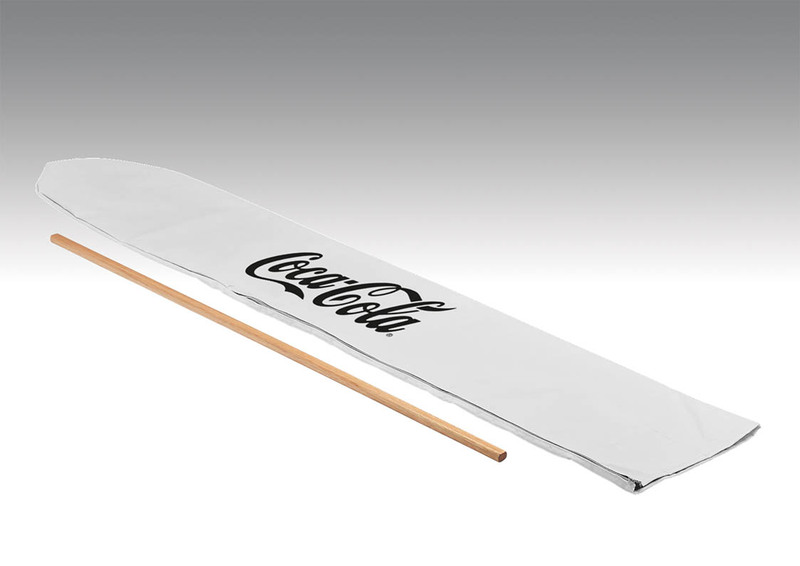 We can make sure your brand is getting the maximum exposure possible, even when your parasol’s canopy is closed, by printing your company branding on your protective nylon canvas cover bag.